There was a moment when I thought about cutting Kansas City out of our itinerary. It was just so out of the way, and involved a lot of monotonous driving on a two-line highway which ultimately made Karen very grumpy. But I’m glad we came. 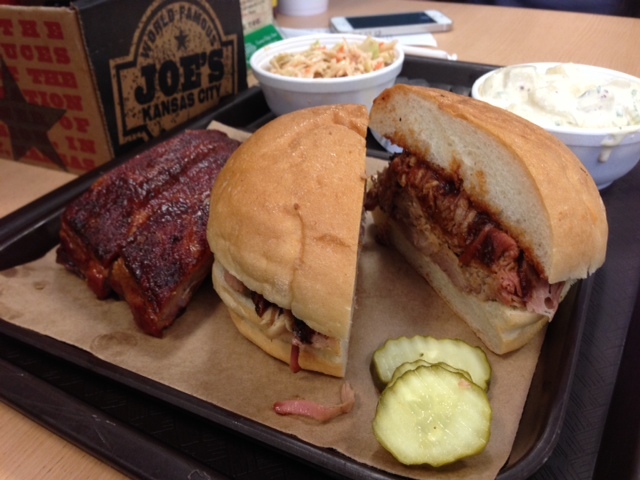 Kansas City is a lovely city, full of lovely people, and its barbecue somehow reflects this. The pork is porkier, the meat is meatier. And nowhere is the sauce any saucier. It’s a good thing Kansas City is so far away from me, because I would weigh 800 lbs otherwise. I have to admit, I get a little bit of a sinking feeling when I see Anthony Bourdain’s photo on the wall. To me, he is the flip side of Bill Clinton: Bill’s photo=generally good grub. Tony Bourdain=crowded and possibly overhyped and full of insufferable food tourists like myself. I want to be the only insufferable food tourist in the room. I think that is the motivation driving insufferable food tourists worldwide. But I need not have worried. Oklahoma Joe’s is awesome. This is helped by the fact that they are used to food tourists, and tell you what their specialties are up front. They are also happy to serve ribs a “bone” at a time, for people who lack the stomach to eat the full slab. Because, come on. Seriously. I think I am developing gout, and I am not even a 50-year-old man. The specialty here: the pulled pork sandwich, which manages to be both meaty and tender at the same time. The ribs, strangely, have a smell reminiscent of Chinese spare ribs on them. They are very, very well-seasoned, on the verge of teetering into Salty Town. When we leave, the line to get a meal inside snakes around the front of the building. I have a feeling it’s not all food tourists. The full name of this place is “Arthur Bryant’s Legendary Kansas City BBQ”. I feel like this is tempting fate a little bit. Also: on the wall, not one, but two photos of former President Jimmy Carter tucking into some ribs. Former President Harry Truman is also said to have been a fan. I don’t know if I trust either Jimmy Carter’s or Harry Truman’s culinary stamps of approval as much as I do Bill Clinton. I’m sorry, but I just don’t know. The good thing: Arthur Bryant’s is quick and friendly, and its slow-smoking oven behind the cooks prominently features several drool-inducing slabs of meat — pork, beef or chicken — cooked over a combination of hickory and oak woods, according to Arthur Bryant’s website. Arthur passed away in 1982 and the restaurant has since been taken over by new owners, but the BBQ is presumably cooked the same way. And the verdict: the burnt ends tender and the ribs are smoky, but that sauce is plenty sweet. I missed the bite of Oklahoma Joe’s or even Pappy’s. Next to the more “DIY” atmosphere of Oklahoma Joe’s and Arthur Bryant’s, Fiorella’s Jack Stack is practically Le Cirque. In fact, it’s the fanciest place we’ve been to in a while, with actual waiters who wear uniforms and pretend you are young-looking enough to warrant an ID check, and tables with booths and menus and everything. Karen and I barely know what to do once we are seated, and pepper our long-suffering server Clint with questions about practically everything we think of ordering. Clint responds by sending over a free plate of deep-fried mushrooms. In one fell swoop, our loyalty is promptly bought. Karen is no fan of beef ribs (hence our exclusion of Texas from this particular trip — lucky you, Texans!) but the house-specific “Crown Prime Ribs”, said to be exclusively a Jack Stack thing, are so meltingly tender and succulent that she is converted. I became a big fan after the BBQ Bloody Mary, which is probably the best Bloody Mary in the world thanks to its generous use of bacon salt. A little more puzzling: the popularity of something called the “cheesy corn bake”, which is actually a cup of melted Velveeta with a handful of corn kernels sprinkled over it. Karen and I speculate what other similar dishes could win us a similar level of acclaim: a “creamy Caesar salad” made up of a few shredded lettuce leaves atop a river of Caesar dressing, perhaps, or maybe a “saucy pulled pork platter” of … you guessed it. Actually, we already had that, back at Arthur Bryant’s. Haha, JK. Love you, Arthur Bryant’s. I won’t mince words. Memphis has better food than Nashville. Maybe this is because it’s a “multi-cultural” town, meaning it’s located at the junction of Tennessee, Arkansas, and Mississippi. Or maybe it’s because of the influence of the King himself, Elvis Presley. We are doing Memphis properly, which means we are staying at the Heartbreak Hotel, situated right next to Graceland. Later we discover it’s basically a Day’s Inn with some photos of Elvis in all the rooms. “At least it’s really far away from everything else,” says Karen. Rendezvous’ most recent claim to fame is the fact Prince Harry and the other one came here a few months ago. But tons of other people have been here, including our very own home-grown princes, the Manning brothers. I did not see a photo of Bill Clinton, however. Or of the King. 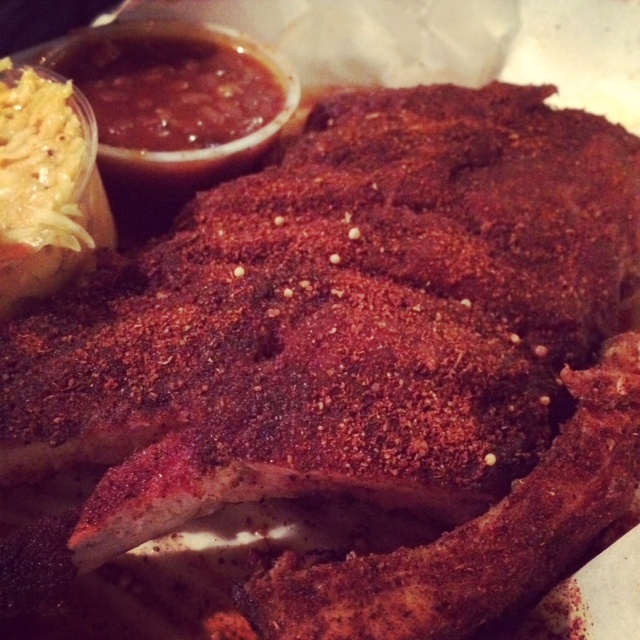 The special here is the dry-rubbed ribs. I have told you before of my feelings about dry-rubbed ribs. I STILL NO GET. Why get something that you have to basically douse in sauce yourself, when it could come to you already properly sauced? What Karen and I ended up loving more: the lamb “riblets”, barbecued lamb ribs in the same spice rub, which somehow sets off the taste of the meat and keeps the meat juicy. These are delicious. And I don’t even like lamb BBQ. I love fried chicken. As in, it’s a shame it’s only fried chicken, because we should be married and have little chicken babies. That’s how much I love fried chicken. So of course I would take a break from the unrelenting BBQ and come here. Thank God this place exists. 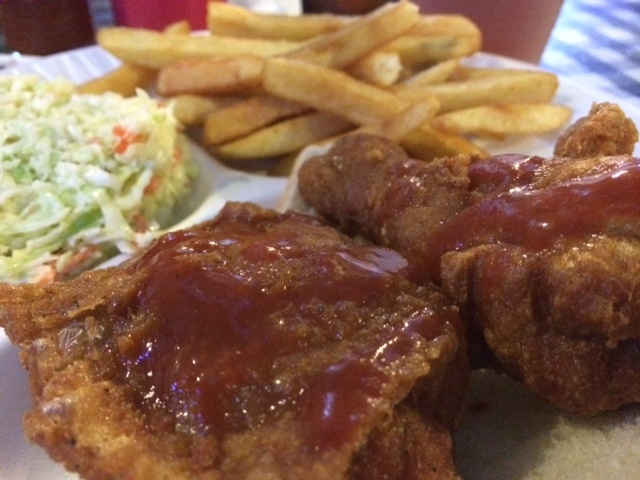 The chicken is as awesome as you might have heard it to be, especially after a liberal sprinkling of the Louisiana Hot Sauce set on every table. Better yet, the pies — coconut, pecan, sweet potato, and chess (custard, a local specialty) — have a wonderfully flaky, savory crust that sets off the extreme sweetness of the filling (don’t worry, we ordered almost all of them, so we almost know what we’re talking about). Also, there is beer. It was a shame to have to leave, but there was a line of people waiting. The love must be spread. I love that you’re doing this and especially love that you went to the trouble to try the BBQ in my hometown! 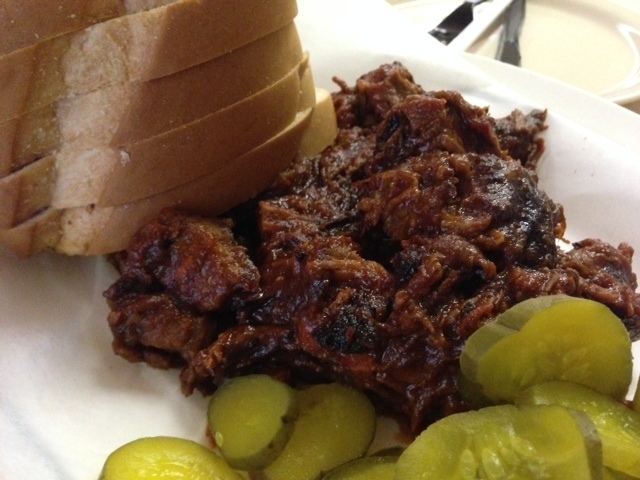 We served Jack Stack at our rehearsal dinner, but Arthur Bryant’s burnt ends will always have my heart. All is well here in BKK where it’s as hot as ever and “BBQ” is served on skewers. Thank you! Kansas City is a great town, and I hope to be back someday! Starting to miss that BBQ on skewers though. 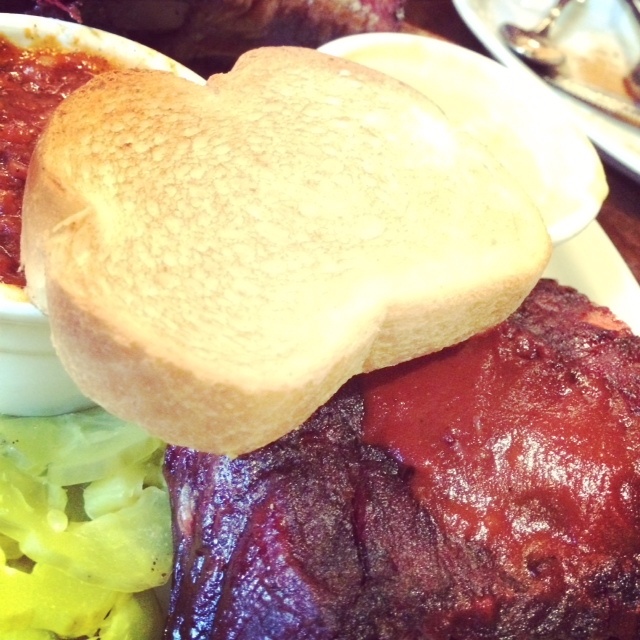 We CANNOT wait to get on your BBQ trail … great pioneering work dear Chow and Karen! Thanks Anney, we’re on our last day! Your recent posts have been sloppily written. Get back to the basics of clear thinking and good reporting. And please stop making self-deprecating comments. Do better work and you’ll feel better about yourself.